The Honor Play 8A has been launched in China at a starting price of Yuan 799. We pitted the phone against the RealMe 1 to see which device packs better hardware under its hood? The Honor Play 8A has been officially revealed in China last week. The device comes with a 6.0-inch display and a MediaTek P35 chipset. On the other hand, the RealMe 1, which was launched last year with a MediaTek Helio P60 processor is now available in India for Rs 12,990. 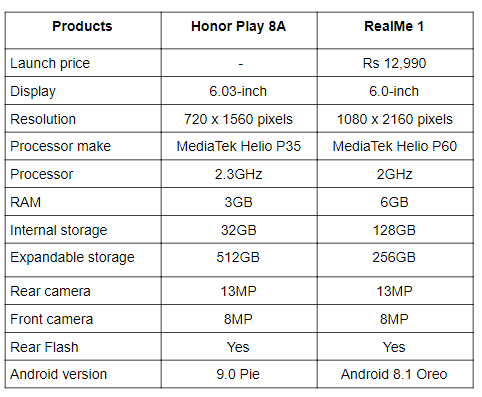 We are doing a comparison of the two, which is based on specifications, features, and price. 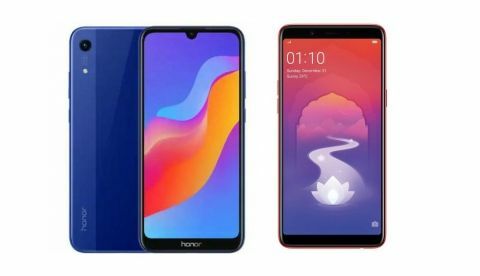 The Honor Play 8A sports a slightly bigger 6.3-inch display that offers a resolution of 720 x 1560 pixels, while the RealMe 1 comes with a 6.0-inch FHD+ display that offers a resolution of 1080 x 2160 pixels. When it comes to the performance, the Honor Play 8A is powered by a MediaTek Helio P35 octa-core processor, which is clocked at 2.3GHz. On the other hand, the RealMe 1 is backed by MediaTek Helio P70 processor. The smartphone is available in two storage models 64GB and 128GB. As far as the cameras are concerned, the Honor Play 8A is equipped with a 13MP rear camera along with an 8MP sensor on the front. On the other hand, the RealMe 1 also has a 13MP rear camera along with an 8MP front-facing camera. The RealMe 1 is available on Amazon for Rs 12,999, while you have to wait for the Honor Play 8A India launch for a bit.